Most people who experience a traumatic event will have reactions that may include shock, anger, nervousness, fear, and even guilt. These reactions are common; and for most people, they go away over time. For a person with PTSD, however, these feelings continue and even increase, becoming so strong that they keep the person from living a normal life. People that are diagnosed with PTSD have symptoms for longer than one month and cannot function as well as before the event occurred. PTSD is not a sign of weakness or moral failing. Anyone can be diagnosed with PTSD, not just those that serve in Military or First Responders. PTSD can affect anyone. All people experience anxiety. Without the experience of anxiety, life would be even more dangerous, though it might be more fun. People wouldn’t prepare for tests or work deadlines. People would take risks that are stupid, and they would become obnoxious and insensitive. Police are witnesses to the effects of violence at rates much higher than almost any profession. This puts them into contact with people living with PTSD, and puts them at risk for developing PTSD. Extreme trauma and PTSD teaches people to fear the world and to feel helpless. If you’ve been attacked by a bear, you will naturally feel very frightened every time you see reminders of bears. What if the bear is your abusing father and you’re eight years old? PTSD has very high rates of co-occurring with other psychiatric illnesses, increasing the risk of having another illness by 80%. Men are more likely than women to have co-occurring conduct disorder and substance use disorders, both of which are associated with increased risk of violence. Be effective rather than right! Trying to convince people you’re right about something, for example, the trauma wasn’t that bad, can usually have the opposite of the desired effect. Arguments and the desire to be right diminish compassion and empathy. All people react to trauma. Most at minimum have some mild symptoms associated with PTSD such as hyper-vigilance, hyper-arousal, avoiding, numbing, and anger. To be diagnosed PTSD, symptoms must last longer than a month. Like all disorders it must cause significant distress or impairment in the indi­vidual’s social interactions, capacity to work, or other important areas of functioning. 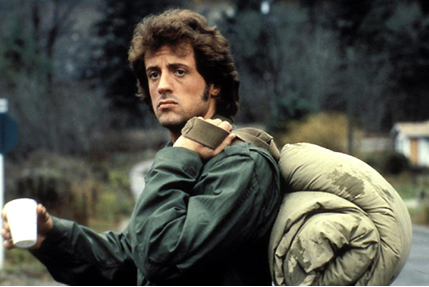 ​Rambo, a movie from 1982, though dated, depicts a soldier who suffers from Post-Traumatic Stress Disorder and has difficulty adjusting to normal life. He is shown to be prone to violence because of the torture he suffered at the hands of North Vietnamese soldiers in the Vietnam War. It’s a good movie and can give a general sense of some PTSD symptoms such as a sense of being numb, as well as being prone to anger. When your sense of safety and trust are shattered by a traumatic event, it’s normal for the mind and body to be in shock. It’s common to have bad dreams, feel fearful, and find it difficult to stop thinking about what happened. For most people, these symptoms gradually lift over time. But this normal response to trauma becomes PTSD when the symptoms don’t ease up and your nervous system gets “stuck” and fails to recover its equilibrium. Efforts to avoid any and all reminders of the trauma, negative emotions, fails to show any emotion. Looks “numb” (exception: ANGER often only “safe” emotion). ~ 80% more likely to have a (second) psychotic disorder than general population is of having one. Diagnosis persists longer than in men. Young children express re-experienceing through play. DO NOT say “It wasn’t that bad…at least you survived…others had it worse…” etc. Trust is very hard to come by; don’t promise anything if you can’t follow through. Do not lie to them! PTSD may not always be the driver of the crisis, there are high rates of co-occurrence with PTSD. Substance abuse, depression, anxiety, etc. It is a much more difficult task than you may expect. Focus on, and use the word, “Safety.” A loss of a sense of safety is a fundamental problem in PTSD. But be careful not to moralize or minimize! Avoid statements like: “Why would you think about hurting yourself? Your wife loves you, you have so much to live for” Because he may believe his wife hates him, or maybe she actually does, either way, you’ll get into an argument. Sadock, B. J., Sadock, V. A., & Ruiz, P. (2015). Kaplan & Sadock's synopsis of psychiatry : Behavioral sciences/clinical psychiatry (Eleventh edition /). Philadelphia: Wolters Kluwer. Kessler RC, Sonnega A, Bromet E, Hughes M, & Nelson CB. (1995). Posttraumatic stress disorder in the National Comorbidity Survey. Archives Of General Psychiatry, 52(12), 1048-60. Stein MB, Kessler RC, Heeringa SG, Jain S, Campbell-Sills L, Colpe LJ, ... Army STARRS collaborators. (2015). Prospective longitudinal evaluation of the effect of deployment-acquired traumatic brain injury on posttraumatic stress and related disorders: results from the Army Study to Assess Risk and Resilience in Service members (Army STARRS). The American Journal Of Psychiatry, 172(11), 1101-11. doi:10.1176/appi.ajp.2015.14121572.